We stock a full range of towbars to fit your Ford Kuga. 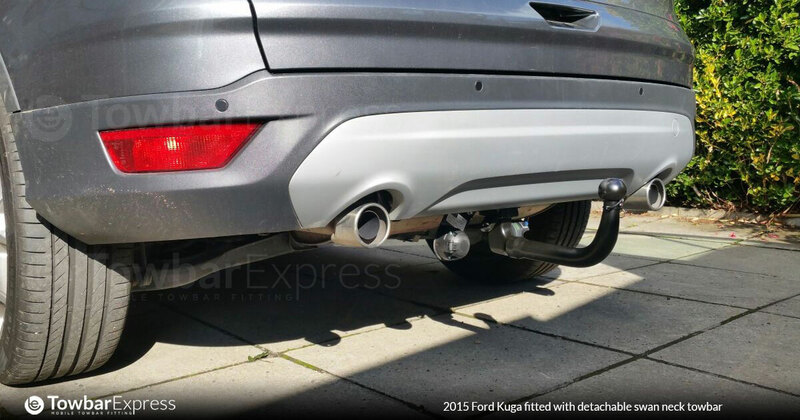 At Towbar Express we use Ford Kuga towbars that are mounted to the exact fixing points specified by Ford. All towbars are Type Approved where appropriate and are available as flange towbars, swan necks and detachable towbars. The Kuga can tow up to 2100lg, with a nose weight up to 100kg. Our towbar fitters come to you at your place of work or home - saving you time and money. To get the correct price for your car, all you have to do is use our registration search above. You can book online, and we’ll do the rest. We directly employ all of our towbar installers, so we won't just contract out the work to a 3rd party company. The Ford Kuga is a great car to have if you’re into camping and caravanning, as they’re extremely durable and practical. This is partly thanks to the All Wheel Drive feature, which is super responsive to cornering balance and grip, so it’s perfect for icy or wet road conditions. The latest models are equipped with technology such as voice control, Wi-Fi connectivity and Innovative Active City Stop which helps drivers avoid collisions in slow traffic. 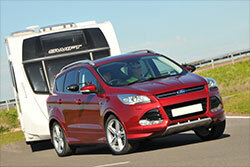 We stock a range of Ford Kuga towbars including the flange, swan neck, and detachable towbars. Flange towbars are incredibly versatile when it comes to choosing different tow balls. A Ford Kuga flange towbar can be used with various accessories including Alko towballs. The detachable flange towbar is a variation on the flange - you can take off the neck from the bar using a lock and key device. The tow ball for a detachable flange towbar is already fitted with an Alko ball - so they’re great for Alko Stabilisers.